Rangers are in Slovenia for the second leg of their Europa League third-round qualifier against Maribor. Steven Gerrard’s side claimed a 3-1 victory in the first game at Ibrox last week and here are some of the key talking points ahead of the return meeting. Rangers have hardly made life easy on themselves by picking up red cards in both their opening two Ladbrokes Premiership fixtures. Alfredo Morelos’ dismissal at Pittodrie was overturned on appeal but boss Gerrard had no complaints about Ross McCrorie’s sending-off against St Mirren. However, with left-back Jon Flanagan suspended for Thursday’s second-leg showdown after picking up his third Europa League booking last week, Gerrard is worried indiscipline is creeping into his side. He has now made it clear to his men they must clean up their act. With Flanagan banned, new signing Borna Barisic ineligible and Lee Wallace still in open dispute with the Ibrox hierarchy, Gerrard will have to turn to Andy Halliday to plug the gap at left-back. That prospect is likely to bring out the Rangers faithful in a cold sweat as they remember the tormenting he received at Celtic Park in April as Brendan Rodgers’ rampant Hoops ran riot in a 5-0 trouncing. But Gerrard says he is a fan of the boyhood Rangers supporter and has given the 26-year-old a vote of confidence ahead of the Maribor return by insisting Halliday has his full “trust”. Gerrard has also been dishing out some heady praise to Ryan Jack after claiming he was jealous of the midfielder’s composed display against Osijek in the previous round. But he was forced to do without the former Aberdeen captain in the first leg against Maribor after he suffered a concussion on his return to Pittodrie last week. Jack was again absent for Sunday’s 2-0 win over St Mirren but his boss is hopeful the Scotland international will shake off the head knock in time to face the Slovenians on Thursday. Last year’s humiliating first qualifying round exit to Progres Niederkorn ranks alongside Berwick Rangers’ shock 1967 victory over their Ibrox namesakes when it comes the Light Blues’ worst-ever result. But the Luxembourg minnows no longer appear to be the no-hopers they were made out to be 12 months ago. 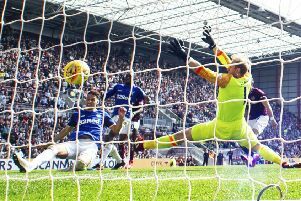 Having already knocked out Gabala of Azerbaijan and Hungarian side Honved, they could set up a repeat clash with Rangers if both teams fight their way through to the play-offs. They claimed a crucial away goal as they lost 2-1 to Russians FC Ufa last week but there would be something poetic about Gerrard’s team getting the chance to bury ghosts of the past with another face-off.